RACE REPORT: KEN HARROD MEMORIAL ROAD RACE 2015 Received Rave Reviews! The second edition of the Ken Harrod Memorial Road Race presented by the Minuteman Road Club occurred on May 30th, 2015 in Harvard, MA. This was the second year the race was held in Harvard after 19 years of MRC presenting a road race in Sterling, MA. MRC’s Chris Pare rolls out of downtown Harvard, MA with the Cat 3 peloton. There were two waves of races, with three in the early morning wave and another three in the late morning wave. This year’s edition included a completely new course including the famous Oak Hill climb, the addition of a P/1/2 race, and a KOM competition. The race helps benefit the Harvard Firefighters Association, and was aided by sponsorship from Murphys Insurance, Landrys Bicycles, 3Cross Brewing Company, Ameriprise Financial, and Sports and Physical Therapy Associates (SPTA). The weather was fantastic on the day, even a bit hot and dry for most riders that left many out of fluids by the end of the race. The Mens Cat 5 race stayed together for much of the race which led to a sprint finish, where Dek Tuttle came out 1st, with Johannes Stromski of Riverside Racing and Orlando Correa of Team Columbia close behind for 2nd and 3rd. In the Womens 3/4, a four woman breakaway got away from the main pack pushed by a Green Line Velo with two women in the group, Regina Legge and Julie Van der Hoop, with Antonina Hafner of Harvard University and Jennifer McCarthy of Riverside Racing. In the end, Legge won the sprint, following by Hafner in 2nd, Van der Hoop 3rd, and McCarthy 4th. The pack sprint was won by Leslie Timm for 5th place. 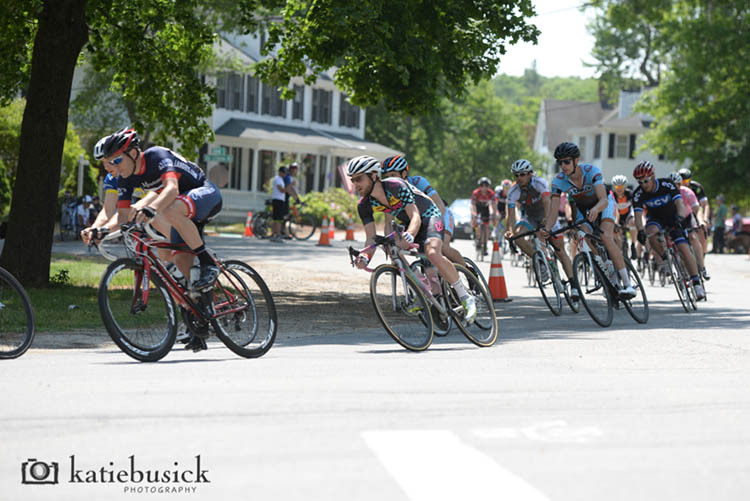 The Women’s 3 / 4 field approaches the turn onto Littleton Road in Harvard, MA. Finally, the Mens Cat 4 race had the largest field of the day and plenty of strong up and coming riders in it. 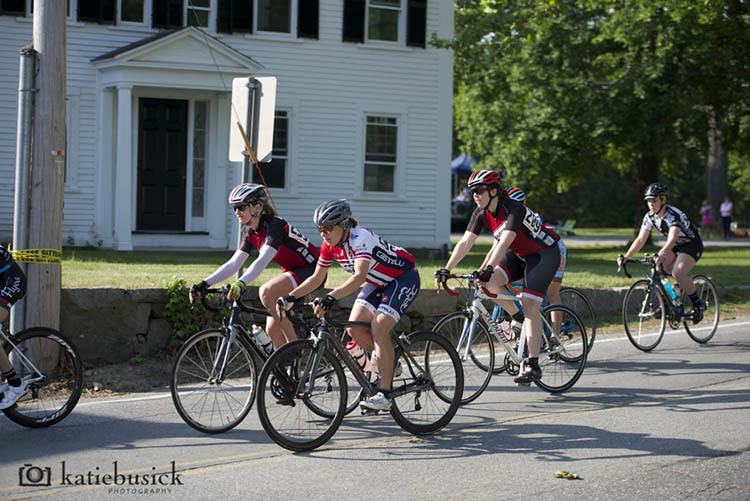 There were plenty of attacks, and on lap 3, a break of two riders looked like it might stick, but Minuteman Road Club and Greenline Velo pulled back the break by the top of Oak Hill. On the last lap, things stuck together as every rider seemed to gear up for the sprint. At the finish, Minuteman Road Club’s Brad Bradford slingshot around the field for the win, with Steven Edwards of PVC/CycleMania, Jeb Fowler of Linen/BCA, Jose Ordovas of Green Line Velo, and Josh Burgel of Bikeway Source/Bell Lap Racing taking 2nd through 5th place. 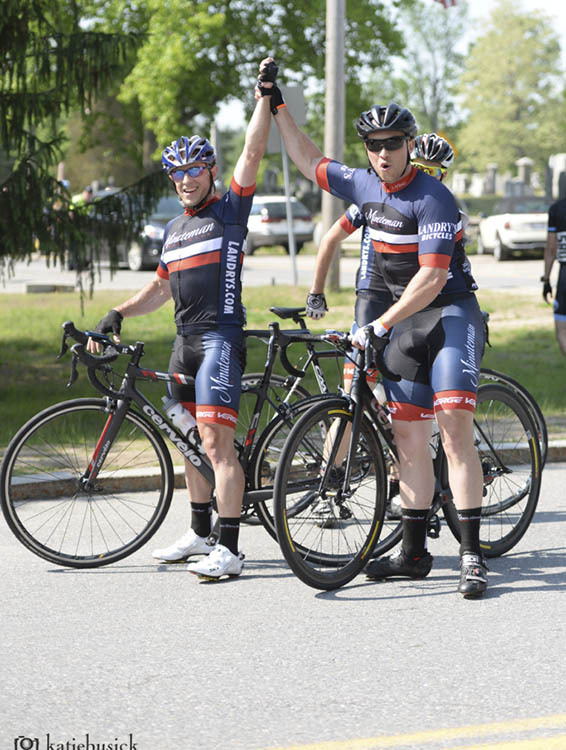 MRC’s Kevin Teves (left) helps Brad Bradford (right) celebrate his Cat 4 victory. The Mens Cat 3 race turned into a slower and tactical race for the rest of the field due to a four man breakway getting away. After an early break was caught on the 2nd lap on Oak Hill, a second major break formed through a counter attack. Dawry Cabrera of NEBC, John Eckert of STAMPEDE, and Brendan Longe of Community Bicycle Racing got away. Although the pack did some work to try to bring back the break, it was not enough to catch it in the end as they were 1 minute ahead with a lap to go. Cabrera won with his own break to come across solo, followed by Eckert, and later Longe. Miles Billings of 545 took off on the last climb up Oak Hill to claim a clear 4th, and then Scott White of Rancourt & Co won the pack sprint to claim the last podium spot in 5th. 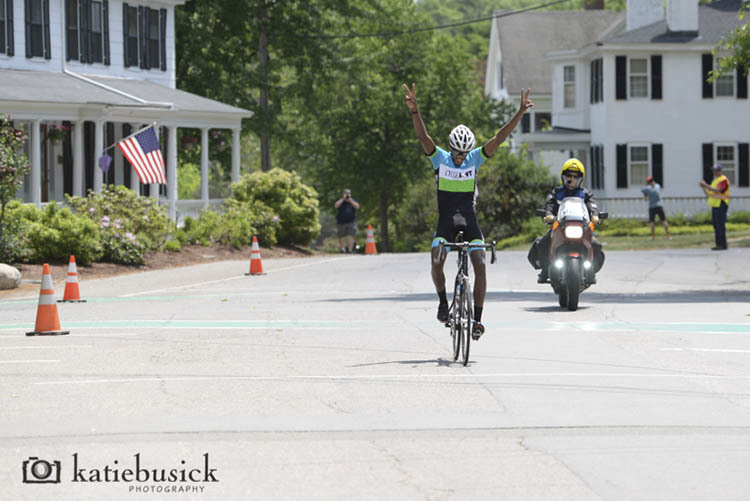 Dawry Cabrera posts up as he crosses the line in his Cat 3 solo breakaway win. The Masters 45+ field had a large field of very experienced riders ready to attack the course. There were many attacks, and the climb up Oak Hill on the 2nd lap was extremely fast paced and caused everyone to suffer. Shortly after, Tom Francis of Wheelworks Racing and Chris Crowell of Stage 1/fusionTHINK got away on a two man breakaway. No one thought it would last, but the pack didn’t work together to share the load of catching the break. By the beginning of the last lap, those two had a 1:40 lead on the pack and mostly had just each other to think about. Francis was able to pull away with a well-deserved win and Crowell getting a well-earned 2nd. Kurt Begemann of Castellli BRS attacked on the final steep part of Oak Hill and stayed away for 3rd, while Guillermo Herrera of Downeast Racing and Robert Campbell of Cycle Lodge grabbed the last two podium spots for 4th and 5th. In the most highly anticipated race of the day, the P/1/2 field got off with a solid field. As usual, the high pace of the field caused many DNFs within the P/1/2 group as many dropped riders decided to save their energy for another day. Keith Kelly of ENGVT-UnTapped was able to get away on a solo breakaway with still 30 miles still to go. He was able to hold that lead until Brendan Rhim and Ansel Dickey (both of California Giant / Specialized) were able to pull themselves up to Kelly along with some of the rest of the field. In the finish, Rhim and Dickey were able to get a small gap and come in 1-2 for California Giant / Specialized. Kelly was able to summon enough energy to get 3rd, with Joseph Siegel of Grinta! p/b Best Buddies Challenge and Brendan McLaughlin of CCB Racing coming in 4th and 5th in a very tough race. We look forward to hosting the 2016 edition of the Ken Harrod Memorial Road Race, which will be on the same weekend (the Saturday after Memorial Day) which is Saturday June 4th 2016. Our plan is to have exact same course as 2015! For complete race results, visit the 2015 Ken Harrod Memorial Road Race page on Road-Results.